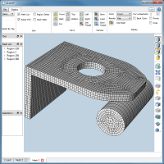 CalculiX is a non-linear structural solver developed by Guido Dhondt und Klaus Wittig at MTU. CalculiX was originally developed on Linux as an open source system. CastNet supports the original Linux version. 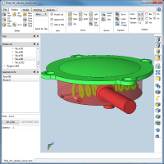 For Windows, a direct executable provided by DHCAE Tools is shipped with runGui. 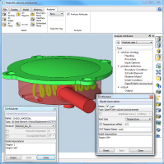 Using CalculiX, a wide number of boundary conditions and loads are available such as fixations, prescribed displacements, concentrated and distributed surface or volume loads. 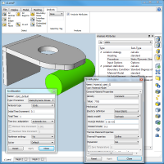 CastNet supports volume and shell elements, two-dimensional element formulation as well as beam elements and spring elements. 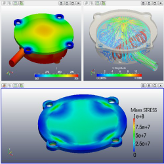 Pressure distributions estimated in OpenFOAM® can be transferred to CalculiX as surface load. 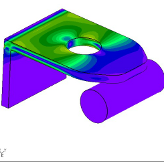 Volume temperature fields from a conjugate heat transfer analysis can be transferred from a solid OpenFOAM® region to CalculiX volume. By this, thermal stresses and displacements can be simulated in CalculiX. For post-processing of CalculiX data, DHCAE Tools provides a VTK translator to visualize the results in ParaView directly from runGui.